As if running a business around a family isn’t time consuming enough, you now have the added hassle of finding time to write your blog. Sometimes the inspiration and the material comes easily – but we’ve all had times when the ideas simply don’t flow and the days without posting turn into weeks and then months. So here are 7 simple ways to find ideas to write about, to keep your blog fresh and up to date and to banish bloggers block for good! 1. What’s in the news? Is there something topical in the news that you can tie in with an aspect of your business or your industry? Maybe it’s a piece of new legislation or a new piece of research which has been published. Maybe a celebrity has said something which could be linked to your product or service. Or is there a big national event about to take place (i.e. election, Olympics, state occasion, competition etc) that you could use as a news hook. You should be keeping up to date with news in your sector anyway, but make sure you keep a broader ear out for any nuggets of news you could use as inspiration. Have you been having any interesting discussions on Twitter or Facebook that you could turn into a blog post? Sometimes a throw away comment can spark some interesting debate – and with a few other opinions added to the mix you could end up with a great opinion piece for your blog. Or maybe you’ve read a post on someone else’s blog that you could respond to (not forgetting to link back to them so your readers can follow the whole debate). have you seen a nice Facebook or Instagram post or YouTube video? Embed them in your post and then add your opinions and spin. 3. Blow your own trumpet! Maybe you’ve been nominated for an award, or have been lucky enough to win one. Maybe you’ve won a big contract or received a glowing testimonial from a client. Don’t be afraid to shout about your successes. Sharing these achievements with your readers will help to improve your credibility and the reputation of your business. And if you can link your success to some shared tip – i.e. how you successfully pitched for the contract, or why your customer service is so praised by your clients, then you will be helping your readers in the process. At the same time if things haven’t gone so well and you have learned some serious lessons then that can sometimes make a good blog post too. Look back through your old posts and see if any can be bought bang up to date with some new facts or data. You could even create a survey of your own, using a free programme such as Survey Monkey, and capture your own tailored set of stats to use in your post. Perhaps you are you celebrating a business birthday. Maybe today is the anniversary of something interesting in history. Or it there a ‘National Something Week’ that relates to some area of your business (this is your chance to think creatively!). Maybe a charity is holding a national awareness week and you could do something to contribute, thus generating some positive PR as well as material for your blog. Your business journey is a great source material, because it’s always changing. And if you are a year or two into your journey, you could be just the inspiration someone starting out is looking for. Are you facing any particular challenges at the moment? What hurdles do you need to overcome to grow your business? You never know – someone reading your post might be able to help. You don’t have to be an expert to share what you’ve learned. Anything pertaining to your industry is likely to help others in that same industry. This could be something specific like your top suppliers, time management tips that work for you, 5 different applications for your product – or it could be a post about a great website or resource you’ve discovered – chances are if you found it helpful, someone else will too. 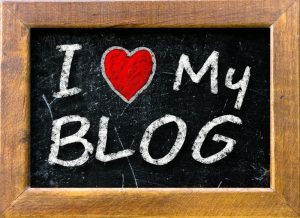 Use your blog to as a way to recommend and to share some love around! And if you have any other good ideas that might help people get their creative juices flowing, please do leave us a comment! Good idea to get rid of those boring and frustrating days. And thanks for suggesting such recycling idea with some changes in it, for Blogging.